Sweat Less, Stress Less: Why I'm Excited for miraDry®! Most people sweat in their underarms when they exercise - Will doesn’t even have to get moving to get sweaty. “I can be sitting down in a t-shirt, just working on the computer, and I’ll still sweat through it.” This is why Will was more than willing to volunteer to get a free miraDry® treatment! As the only FDA-approved, non-surgical, permanent solution for underarm sweat, hair, and odor, miraDry® can be life-changing for patients like Will. Will has been dealing with excessive sweat for most of his life. Every day, he goes through extensive measures to keep sweat at bay - taking multiple showers, reapplying deodorant an average of 6 times per day, and keeping multiple shirts in his car at all times. His hope is that miraDry will enable him to stress less about sweat so that he can enjoy everyday activities more freely. We asked Will a few questions as he was getting his miraDry treatment done this week. 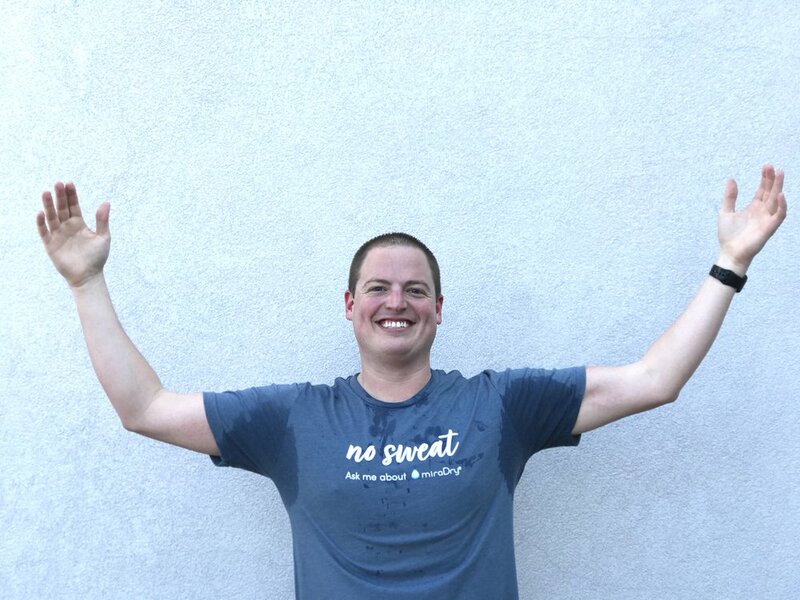 Read on to learn how excessive sweat has impacted Will day to day, and stay tuned for a later post to learn how miraDry® has impacted Will’s life! What do you have to do every day to prevent excessive sweat from getting in the way of daily life? “When I shower, as soon as I get out, I have to dry my armpits and have to put on antiperspirant right then - otherwise it won’t be effective. I have to plan out what I’m wearing throughout the day - If I have to be in a specific shirt by mid-morning, I don’t put that shirt on in the morning. I’ll wait until right before to change into it. I keep 5-6 shirts in my car at all times. When did you first start experiencing issues with underarm sweat? How often do you have to reapply antiperspirant? How has sweat affected what you wear? “For work, I have to wear dryfit. Dress clothes, I have to be really picky. I’ll often take a water bottle with me, so that when I’m trying on clothes, I can test how the fabric will react to being wet. I can’t just buy clothes online, because I have no idea that it’s going to be something I can actually wear until I feel the fabric. I can wear a shirt for like 20 minutes before I sweat through it, so I need to be able to know that the fabric will be okay. Do you think you spend more money on clothes because of sweat? When do you sweat the most? What are some of the most extreme measures you’ve taken to reduce or hide your sweat? What about other big events? “At my brother Spencer’s wedding, I rented two extra shirts to go under the suit, and then I had like 10 undershirts for that day. During breaks, I would hold my shirt up to the vent to try and dry it out. I’ve thought a lot about how this would affect my own wedding and other big events in my life. How has sweat affected your confidence or self-esteem? What have you tried to deal with this problem? “In high school: Spray deodorants, gel, etc. This was before clinical strength was big on the market. Just when I thought I had found something that worked, it’d leave residues that would bother me or it’d stop working. There’s a section in Walmart that has the ‘extra strength’ stuff, and I’m pretty sure I have bought all of those. They didn’t really work any better than the regular deodorant/antiperspirants so I stopped using them. Have you ever seen a doctor about it? Stay tuned to see Will’s results with miraDry®! Interested in getting miraDry® for yourself? Schedule your consultation here! There’s plenty to stress out about on your wedding day - don’t let underarm sweat or odor get in the way of your big day! Learn how miraDry can help you feel confident and fresh on your wedding day. miraDry is a revolutionary FDA-cleared non-surgical treatment that permanently reduces underarm sweat, odor, and hair - in just one hour. Over 100,000 miraDry treatments have been performed worldwide. Learn more from one Jonesboro woman’s experience with the miraDry treatment!